The one more-or-less organic place to tell some trans* stories was the frequency of male and female impersonators on the stage in 1890s-1910s (and beyond) Seattle during the Yukon gold rush. This was obviously a pretty poor choice. Most of these stage performers were not what we would call transgender. They were performers who offstage would be present themselves as their biological gender. Their appeal was in how accurately they were able to perform as the other gender. Looking back, the only good reason I had for including these performers was to show how even in 1890, the knowledge of gender as a performance (à la Judith Butler) was somewhat understood. In any case, the whole topic is fascinating and I could do a million tours on gender performance and expression in history and I didn’t do the best job representing trans* voices in that tour. So all this has been on my mind since that time. I imagine that at some point in every historian’s life, they find out a little tidbit of something that is so interesting and awesome, they simply have to follow that rabbit hole to whereever it leads. And then, after gettting super excited and doing a little research, they fall victim to what I call the “Simpsons Did It” phenomenon. I am referring to doing a bit of research into a person or event that seems awesome, but never written about, and then finding that someone has written a book about it. A good book. That is better researched than your blog could hope to be. And has photos. And is well-written and delightful. Everything you wanted your eventual best-selling book about the same topic to be. Much like I’m sure the creators of South Park sometimes feel when they have an awesome idea for a show and then find that the Simpsons already did it. The free hand men were not always men, though. 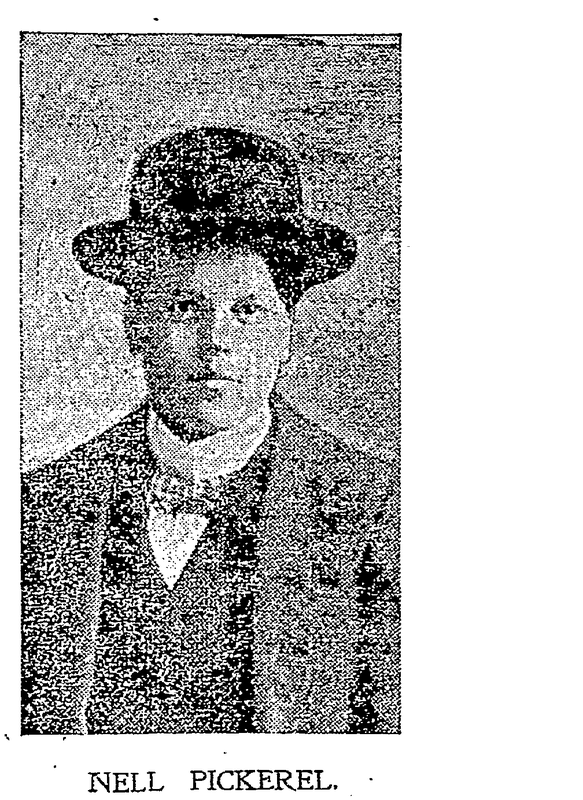 Nell Pickerel, a notorious “male impersonator,” was arrested for “riding at a high rate of speed with her hands off the handle bars” while wearing a man’s suit. Pickerel was a well-known and oft-arrested Seattle character who gained notice for fighting, frequenting bars and wooing women lovers while posing as a man. In this case however, it was her riding that warranted arrest, not her scandalous wardrobe. I’m going to ignore some of the way that Mr. Berger describes Nell Pickerel because he is simply using a titillating story he found in the Seattle Times while looking for reckless bike riders. But I was far more intrigued with Nell than with the bike riding history. 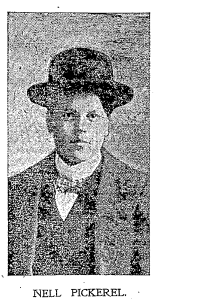 I quickly did a search for “Nell Pickerel” and found a fair amount, both on the Seattle Times Historical Archive at the Seattle Public Library, but also just online, including a blog. The first thing I found is that Nell generally was known by the name Harry E. Allen or Harry Livingston. I am going to make small leap and assume that since he was using a male name and presenting himself as male, that Harry was a transgender man. Of course, that term wasn’t used at the time, but when you tell everyone you are a man, dress in what is considered male attire, I feel fairly comfortable using “transgender man” to describe him. So I will refer to to Harry using male pronouns for the future. I was all excited with this information. I was going to write a biography and make millions! But then I found out that the Simpsons Did It. More accurately, that Peter Boag had written a book called Re-Dressing America’s Frontier Past. I vaguely remembered that a person who took my tour in June had mentioned the book, so I borrowed it from the library. And of course the first chapter discusses Harry at length. So already I was beaten at writing about Harry’s life, and it was better than I could do, and more importantly, connected his life to the many other transgender people who helped settle the frontier. Damn. There goes my millions. However, Mr. Boag doesn’t address Harry’s time in Seattle much, so in my next couple of blog entries, I’m going to write a bit about how Harry became notorious in the Emerald City and the public perception of him; at least in the newspapers of the time. And what does this have to do with Block 113? Nothing. It’s my blog and I make the rules. We’ll get back to Block 113 soon. This entry was posted in Queer History and tagged Harry E. Allen, Harry Livingston, Nell Pickerel, transgender, transgender history.